If you are looking to improve skin tone, fine lines, sagging skin around eyes, cheeks and mouth or conscious of the puffiness and dark circles under the eyes, then PRP may be the best treatment for you. PRP or platelet rich plasma utilizes ingredients present in the individual’s blood in order to regenerate their skin and revitalize collagen. Through a simple blood draw, a little is blood is drawn and using our centrifuge machine, the blood is spun down in order to take out and concentrate the stems cells, growth factors and platelets important in tissue healing. 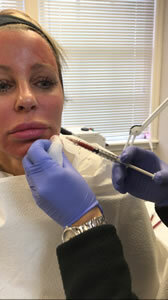 PRP injections differ from fillers. PRP fuels collagen growth for facial rejuvenation instead of individual wrinkle enhancement. Most fillers such as Juvederm or Restylane only last for a short time. PRP injections are recommended for faces that appear drawn to soften eye puffiness, enhance overall skin tone, texture, and tightness and address areas where fillers are not able to reach. Would I benefit from PRP? Well if any of the following pertain to you, call us to schedule a consult. My Skin color becomes more gray and I feel like I’ve lost my glow. My skin texture becomes less smooth and this also makes me feel worn out or tired. Can I afford the PRP Injections? The cost of your this treatment is based on the size of the area we agree to treat as well and the amount of correction you desire. At Omni MedSpa may pay by cash, personal check or major credit card. We proudly offer the highest quality and highest concentration of PRP on the market with the lowest variance.